Welcome to week 44 of From Blogging to Jogging and thanks as always to everyone who linked up last week. Thankfully a few long family walks have boosted my miles in the last week so maybe I’m at a turning point now, fingers crossed! From Blogging To Jogging is open from Monday morning until Sunday night for all your health, fitness and well-being posts so whatever your goals, healthy recipes or tips are, please do come along and join the party. Very simply, please comment on at least two other posts and more if you’d like to and grab the badge for your own post, linking one post per week. 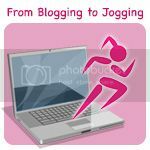 Tweet me (@BuddingSmiles) once you’ve linked and please use the #BloggingToJogging tag so that I can find your posts easily to RT them and you can also use the Twitter hashtag on Instagram if you have any relevant photos.